This is the first episode of the ALL NEW TABLE READS! With this episode, we welcome back Kelly Leviay as a full-time co-host and introduce Joshua Baker as a second full-time co-host in addition to show creator Shawn McBee, making Table Reads a 3 person podcast! 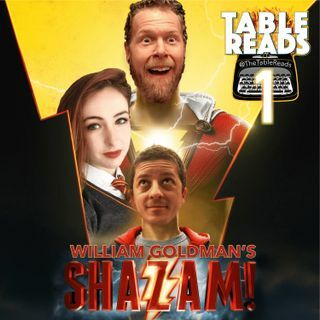 For the first foray of the new lineup, we’re reading our first script authored by an Academy Award winner: Shazam, by the legendary William Goldman! Get a listen at what might have been if the new film starring Zachary Levi had been ... See More made about 10 years earlier (probably without Zachary Levi).